online with one simple tool! Start building your employee handbook today! Employee Handbook Builder has been a valuable resource for us. It has saved us valuable time and has given us peace of mind in knowing our handbooks are in compliance. The Employee Handbook Builder Difference: BLR's Employee Handbook Builder is a completely browser-based system, unlike software products that require you to download files on to your desktop. With Employee Handbook Builder, you can build, access, and update your handbook from any computer with a browser and an internet connection. Applicable state and federal policies are reviewed by Jackson Lewis P.C. and are updated throughout the year. Your handbook is hosted on our secure servers and can be made available over the web to employees with real-time updates that you provide. An employee handbook does more than protect your company from legal liability. A clear and concise handbook defines standards for workplace conduct and describes employee benefits, company policies, and state and federal laws. 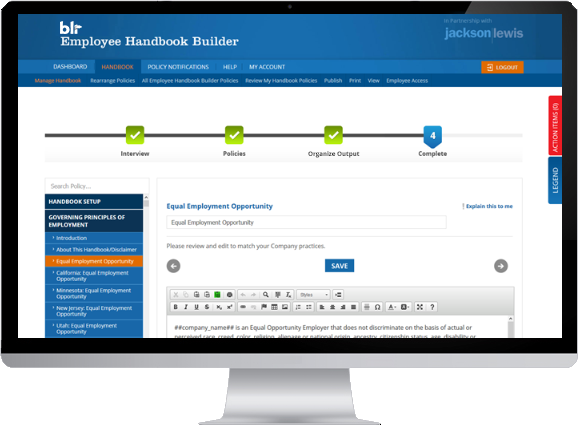 Using Employee Handbook Builder, you can produce a fully customized employee handbook in a few minutes-something that would typically cost thousands of dollars and require weeks of valuable company time.